KENTA makes his ROH debut defending the GHC Junior Heavyweight Title against Low Ki! Bryan Danielson defends the ROH World Title against the debuting Naomichi Marufuji! Xavier puts ROH Title on line vs. Paul London plus a 4-Way with American Dragon, Low Ki, Samoa Joe & Steve Corino decides next challenger! Hey, my login still works! Christopher Daniels goes one-on-one with Doug Williams; Samoa Joe makes his ROH debut against Low Ki; plus nine other matches! 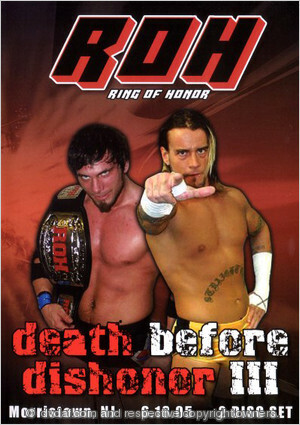 Check out 18 of the best matches from ROH in 2003, featuring Samoa Joe, Paul London, AJ Styles, Low Ki, Bryan Danelson, CM Punk, and many more! This week's Rasslin' Roundtable discussing the first decade of TNA! Part 2 of a 4 part series. This video is from the official DGUSA YouTube channel hyping the Low Ki & El Generico match. The Decade of Honor series continues with Part 2, including the rise of Samoa Joe, and a feud that made two men's careers. Join me in the first part of a 10-part series looking back at the entire history of Ring of Honor! Are Colt Cabana and the Kings of Wrestling coming to WWE? It seems like it. What will happen to them and how will ROH move on? Good news wrestling fans, Dixie Carter has been allowed out to play by Bob and Janice.